In the interest of exploring further the mysteries of Canyon de Chelly, we got up before dawn for a ranger-led hike down the Tunnel Trail. Normally the trailhead is gated and locked, so the only way to hike it is with a guide or ranger. It’s an easy hike into the canyon, about 300 feet of total descent/ascent, with a short steep section. About 80 families live in the canyon, according to our ranger (who is herself Navajo and a resident of the canyon). They live seasonally, farming in the summer and heading up to the mesa or into the town of Chinle during winter because ice and snow in the canyon can be a problem. Although guidebooks like to portray the Navajo of Canyon de Chelly as “living in the historical past” and imply that they are like Amish and eschew modern conveniences, it’s really not true. They run tours and travel through the canyon in late-model pickup trucks. They are educated people, attending the K-12 school in Chinle and in many cases going on to college, as our ranger did. They speak English as well as Navajo. But on the other hand, in the canyon they tend to live agricultural lives, raising sheep and corn, living without TV (there’s no usable signal in the canyon), and relying on generators for electricity. The really obvious difference, to me, was that the Navajo have lived in this canyon for hundreds of years, and in all that time they have respected the many ruins, human remains, petroglyphs, and pictographs left behind by the Ancient Puebloans (Anasazi) so that all of those things are still right out in the open to be seen by tourists today. The Navajo regard all of those remnants of their ancestors as being protected, not by National Park Service rules, but simply out of respect for those who have been here before. Our second stop on the hike was “Newspaper Rock,” so-named because it was a place where later natives, including Navajo, Hopi, Zuni, and other tribes, stopped to write messages in petroglyphs. The variety of petroglyphs here is amazing, and with a guide to rock art symbols (obtainable at most visitor centers) you can take a guess at what some of the messages mean. Often over the cliff dwellings there are clan symbols, but at Newspaper Rock there are no dwelling ruins, so it seems to be just a place to post a message. At the end of the hike, the oldest person on the hike (age 76) asked for a picture of herself with the youngest person on the hike (age 8). Our ranger, Geri, also joined in — and of course, Zoe the cat who goes on all hikes. Our exploration of the canyon lasted for several hours, so once again we really felt like we’d gotten a great ranger tour. Unfortunately, when we returned Eleanor opened her bag and realized she dropped a plastic sleeve containing her driver’s license, three credit cards, a few less important cards, and $70 in cash. This wasn’t discovered until we had returned to the Airstream later in the afternoon. We searched the car, the Airstream, and tried the visitor center’s lost-and-found, but she concluded it was lost in the Canyon de Chelly wash. We shut down all the cards with three quick phone calls, and then in the middle of the night she woke up and remembered where they were. Too late — new ones are on the way. But at least she didn’t lose the $70, and our plastic is not littering the bottom of a National Monument. There is currently some discussion about whether the Navajo should reclaim the canyon from the Park Service and run it themselves. They have that right, under an agreement struck in 1931 when the park was first opened. Most people (including Navajo) seem to feel that the Park Service has done a good job at protecting, interpreting, and managing the canyon. It has a good visitor center, cooperates well with the locals, maintains the infrastructure (campground, roads, trails, signs, fences), provides law enforcement, promotes the canyon nationally, etc. If the Navajo run it as a tribal park (as is done with Monument Valley), it’s not clear what will happen to it. Right now everything is free, supported by the National Park Service’s funding. I would expect that fees would be instituted for everything, including guided hikes, camping, and the visitor center. It would also likely be struck from the NPS list of parks, which might reduce visitation. From what I’ve heard, reducing visitation is not the goal of the proposal. There was an open forum for the Navajo in the campground amphitheater yesterday afternoon on the subject, but since we were busy looking for credit cards, we couldn’t go. I’ll be interested to see if the idea goes further. A few weeks ago I was thinking that we had excess time in the schedule before going to the Balloon Festival, but now time has run short on us. We need to meet everyone for a caravan into the Balloon Festival on Friday, and between now and then we wanted to visit several more parks in New Mexico. Chaco Canyon will have to be skipped this time, and we may also miss Petroglyph National Monument. This week I have to be in locations where I can make reliable cell phone calls, which may even make it impossible to visit El Morro and El Malpais National Monuments. Plus, on Thursday night we need to be somewhere with a dump station, so we can arrive at the Balloon Festival with empty holding tanks. That rules out some interesting boondocking possibilities I would have explored later in the week. We don’t have a firm plan, as usual. We’ll wing it this week with a combination of whatever works. We are in our last two weeks of full-timing, and there’s no point in getting rigid about the schedule now, after three and a half years. This national park is very different from the others. There are people living in it. The national monument, which is made up of both Canyon de Chelly (pronounced, “shay”) and Canyon del Muerto, is the home of Navajo people who continue to live and farm traditionally. As long as they are there “” and they have no plan to leave “” the Anglos who come to see the monument are required to observe the canyon from the rim. We are not allowed to enter the canyons without a Navajo guide, either by foot or by car. We’re also asked not to photograph the Navajos, their animals, or their homes. After all, they are real people who want privacy. So there are two primary places that most people go when visiting this national monument. They drive the North Rim and stop at one of four overlooks, and they drive the South Rim and stop at the other seven overlooks. From these overlooks you can see the deep walls of the canyon, cultivated fields, sandy primitive roads, an occasional house, and a couple of cliff dwelling ruins. It looks idyllic from above, and all the more interesting for being prohibited to non-Navajos. Everyone wants to get down to the bottom, but there is only one hike that you can do in the park without a Navajo guide or a park ranger. The White House trail steeply winds all the way down to the canyon floor and ends at the well-preserved White House Ruin (2.5 miles roundtrip, 500 ft elev. change). It’s a beautiful hike, which we did yesterday. In fact, the whole canyon is stunningly beautiful. Unlike most other Four Corners canyons, this one is lush and green, with a flat bottom and homes situated through it. The walls are sheer and tall, like in Zion National Park, covered with natural varnish, and fanciful spires and pinnacles of rock decorate the edges. I’ve uploaded many more pictures to my Flickr album. There’s one other hike, led by a ranger down the Tunnel Trail. We have signed up to take it this morning. It leaves at 7:30 a.m., which makes sense because each day it has gotten somewhat warm and thunderstorms seem to be the pattern in the afternoon. We’re going because (a) it’s the only other hike available; (b) we’ll get some interpretation by the ranger along the way, and probably learn something. At the amphitheater ranger talk last night, we met the ranger who will be guiding us down the trail and she is promising some very interesting sights. The other option for getting into the canyon is to take a Jeep tour, or hire a Navajo guide to ride with you in your own car (4WD, high clearance required). The visitor center staff does this for you. The cost is $15 per hour (3 hour minimum) for the Navajo guide. We seriously considered it, but after having been in the canyon today and having another chance at a different part of the canyon tomorrow, we probably will skip a third opportunity. We’ll decide that tomorrow. “There’s not much there,” I was told about the Navajo country, by somebody in Utah. That’s true in the sense that there is little in the way of tourist traps, adventure tours, and shopping malls. But as it turns out, the absence of “things” is part of the interest of the area. There are fewer signs of man, which makes the ones you do see more obvious. The Navajo Nation is a study in the collision between traditional and modern life, and so almost every little thing tells a story. Little hogans (traditional round houses) sitting next to 20th century mobile homes are everywhere. Everyone drives pickup trucks, but horses roam free by the roadside. In canyons people live by traditional means, but just above them on the mesa their neighbors have a satellite TV. Across from the entrance road to Navajo National Monument is a coal mine, which pumps out coal from the Black Mesa to feed the Navajo Generating Station in Page, 80 miles away by electric train. The power station eats 1,000 tons an hour of coal, and it all comes from the mine near Shonto, in the heart of Navajo country. Driving east on Rt 160 from Navajo National Monument, you soon come to a turn in the road where you must decide if you are heading north to the famed Monument Valley (setting of many a western) and into Utah, or continuing south-east to Canyon de Chelly. Since we started our great circle tour of national parks up at the intersection of the Four Corners, and are heading to Albuquerque, our choice was obvious. The ride, along Rt 160 and Rt 59 is stark but beautiful. It is designed to bore children and people who are mostly interested in their next shopping opportunity, but we liked it just fine. We stopped in the small town of Many Farms at the intersection of Rt 59 and 160, and caught up on our laundry at the combination gas station/convenience store/ laundromat. This was really the first time we’d been among the local people in a normal setting. I don’t count the interactions with weavers and painters at the national monument, because they are sort of “on show.” There’s nothing like a laundromat to bring everyone to the same level: we’re all just there washing our clothes, being regular people. Like many towns, the people we encountered ran the gamut. A panhandler knocked on the door of the Airstream looking for a dollar, while we were getting the laundry together. From his eyes and general appearance I would have to say he was an alcoholic. In the parking lot a crew of two was working hard on some maintenance task, in the convenience store a steady stream of people came and went (including Navajo, white missionaries in ties, and traveling businessmen from outside the reservation), and in the laundry young women were tending to their laundry with toddlers running around their feet. In short, it was just a slice of modern life. I may have been looking for something else, but really, at laundromat sitting at the intersection of two highways, there’s not much else you could expect. The inner workings of the Navajo community aren’t on display everywhere. So for a glimpse into the community, I bought the local paper (Navajo Times) and read that while the laundry spun. The Navajo Times is surprisingly well-written, for what I would guess is a relatively small-circulation publication. I’m used to local newspapers being total rags, filled with generic wire stories and relatively little local news. What there is of local news is usually badly written by underpaid recent college graduates. The Navajo Times exceeded my expectations. It appears to hire reporters who actually do their research and write readable articles. The subject matter, however, was discouraging. Of the lead articles, most were related to various people attempting to scam others. A real estate agent from out of state, already arraigned in court in Montana on bad-check and fraud charges, showed up in the community of Teec Nos Pos and scammed locals with promises of a resort development. The Speaker of the Nation is embroiled in a scandal with an architect who says he was cheated out of $250k in fees “” it’s not clear who is scamming who. A local woman who donated land to the airport now says the town has taken more of her land than she agreed to “” she doesn’t read or write but somehow managed to sign a contract. It all sounds like history repeating itself. Battles over land and money continue. It’s not far from Many Farms to Chinle, the town that forms the gateway to Canyon de Chelly. We pulled into the national park campground, called Cottonwood in the early afternoon (carrying lots of fresh laundry at last) and settled into a site that has good sun coverage most of the day. We’ve been running on solar power since a week ago Thursday, with great success, and we don’t expect to see a power outlet until at least Monday. There is cell phone coverage in the area of the campground and visitor center, but it is an independent operator and so for most people calls will incur “roaming” rates. We won’t be making any calls in the next couple of days. We also found a pleasant surprise: the Thunderbird Motel, which borders the campground, provides free wi-fi. We can pick up the signal from the Airstream since we are parked very close to the motel, so once again I can keep the blog updated in a place where I felt I would have no chance of getting online. Today we will do some exploring of the canyon, and I’ll tell you about the unique features of this particular National Monument. There is only one trick to seeing Betatakin Ruin, one of the best-preserved cliff house dwellings in the entire southwest: get up early. The reason is the crazy time zones around here. Arizona does not observe Daylight Savings Time, so it stays on Mountain Standard Time all year long. However, the Navajo nation does observe Daylight Savings Time, which means that in the summer it is one hour later here than in the rest of Arizona. Seven people signed up for the ranger-led tour of Betatakin Ruin, but only five showed up at 10:00 a.m. MDT. The other two were probably thinking they still had an hour to get ready. Betatakin is a jewel among the many Ancient Puebloan ruins scattered around the Four Corners. Tucked under a massive natural alcove, it has been preserved from rain for over 700 years. It is a fairly large dwelling, with several kivas, pictographs and petroglyphs, and a “supergranary” high above for food storage. We saw dried corn cobs and potsherds all over the place, and original wood still in the ceilings. It was an amazing tour. The only way to see Betatakin up close is to take the free ranger-guided hike. If you are physically capable, you definitely should make the effort. The interpretation done by our ranger was superb, and with five hours of hiking and viewing time, we got a very good understanding of everything we saw. This was undoubtedly one of the highlights of our Four Corners tour, and that’s saying a lot! Taking the tour requires that you be able to hike five miles with a descent and ascent of 700 feet including some steep switchbacks and a little bit of sand. The altitude is 7300 feet, so being acclimated for at least a few days is essential. You also should have good hiking shoes, at least two liters of water per person, snacks, and all the usual sun-protection stuff (hat, sunglasses, sunscreen). But for all the warnings and preparation, it wasn’t terribly hard and it certainly was well worth the effort. You have to be here to understand the beauty of this place. Even if you can’t do the hikes, the rear patio of the visitor center will give you a clue. The air is clear and the long canyon vistas are gorgeous. Down in the canyons and sandstone alcoves there is water, year-round. The stone provides shelter from heat and rain. Wildlife is hidden but present. Everything you need to survive is here, if you have the proper knowledge. The Ancient Puebloans recognized the values of this area and managed to “dry” farm it for decades before they suddenly (and mysteriously) moved on. Today, the Navajos live here, a bit modernized, but still carrying on values and traditions that have been part of their culture for centuries. Both the Navajos and the Ancients have their secrets, making the entire place seem mysterious and magical. Navajo NMON may be little visited, and far off the beaten path, but I can recommend it. Bring what you need, and stay a couple of days. About 80 miles from Page through rugged and open Navajo country has led us to Navajo National Monument. I can only post a quick blog right now because we are going to head off for a 5-hour ranger-led hike to Betatakin Ruins, which you can see in the photo below. Getting to the canyon involves a lot of backcountry hiking on switchbacks and sand, to across the top of the plateau shown in the photo, then down into this deep canyon, and back to the overhang where the ruins can be explored. The campground is very pretty, with wonderful day and night views. The stars are almost as good as at Hovenweep, which is not surprising since we have come around almost full circle in our Four Corners tour, and are not that far from Hovenweep. I am really starting to love this part of the Four Corners. In the visitor center there are Navajo women making rugs and sashes, which you can buy. The 2.5 ft x 4 ft rugs run $600, so we didn’t get one, but from all accounts they last forever. Since these women rely on tourists for their income, they also charge to take pictures of them working ($5). The work they do is intricate and beautiful, and I wish I could buy something just to support the tradition. From what I hear, it is dying out as fewer Navajos choose to learn these techniques. I experimented last night with nighttime star photography for the first time. The results were not great — I got a reddish flare in the upper left corner of all my long exposures, and lots of “noise”. I need to read up on the right settings to use, because the night sky here is too stunning to let pass by without some more photos. I am also amazed I’m able to get online with my Verizon card (for the record, from site #4). I’ll post again tomorrow with photos from the Betatakin hike. I really like visiting Page. In the first couple of years, when we were keeping an eye out for possible places to establish a home base, Page went on my list. I like the fact that it is remote (80 miles from any other towns), surrounded by classic southwestern recreation, has a massive lake, is in the desert, has good local services, and enjoys fine weather. But we eliminated Page from the list because we ultimately decided that a home base needed to be closer to a city. We wanted the option to conveniently fly out if needed, and the added resources that cities bring. These criteria also knocked the beautiful Owens Valley (CA) off our list. At 4300 feet elevation, Page is also a little higher than I’d like for over-wintering. Tucson made a better fit for its relatively low altitude, averaging about 2000 feet. But Page is undeniably a nice spot. 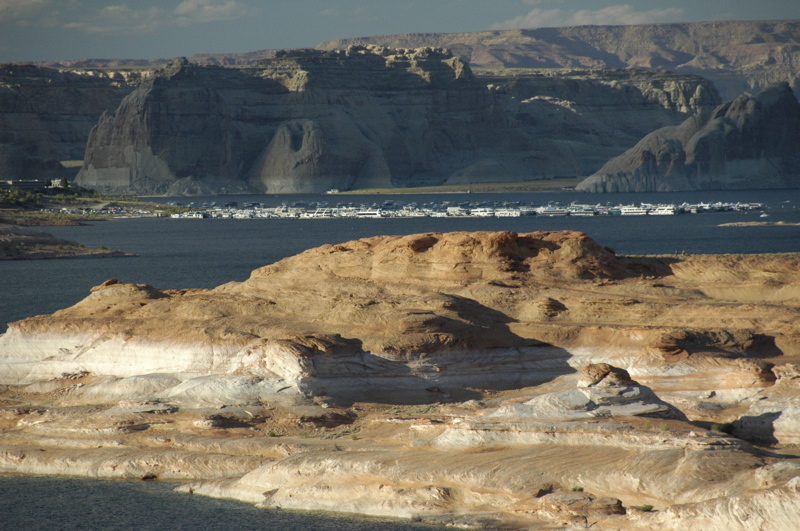 From many places in town, you can see Lake Powell, a startling blue jigsaw puzzle piece sitting in the middle of sandstone formations just a few miles away. I like seeing glimpses of it while in town doing routine errands. The lake is here to stay, but that doesn’t mean there isn’t some controversy about it. The Glen Canyon dam that created the lake prevents the Colorado River from seasonally flooding the lower river basin, especially in southern California. It also generates over a gigawatt of electrical power (when the lake is full), and of course the lake makes a nice recreational spot. And the dam won’t last forever. It will silt up beyond usability in 500 years, but long before that it will start to have age-related problems and eventually somebody is going to have to figure out what to do with it. All of the dams built on the Colorado have the same issues. Hoover/Lake Mead will get a little extra time because Glen Canyon is capturing more of the silt (being upstream). So Page is a beautiful spot today but also temporary. It was built as a worker’s town in the 1950s, enjoys its heydey right now, and will perhaps someday fade if Lake Powell disappears in the distant future. It could happen. You only need to look at the impact on Salton City, CA, as the accidentally-created Salton Sea evaporates today. We’ve managed to get our shower drain working again, at least enough to be usable. (I’m going to buy one of those gadgets that our friend “Gadget” used on his shower.) We’ve refilled on groceries, propane, gas, and water. We’ve done all the immediate work and online banking that needed to be done. So with all that completed, we are going to leave Page today and head into Navajo country. That’s not far — just to the edge of town — but from here the Navajo Nation extends to the New Mexico border, and beyond that are other Indian nations. The entire northeastern corner of Arizona is Navajo and Hopi territory. It is open, spread out, occasionally rugged, and very quiet. Towns are scarce. It’s really more of a series of scattered outposts, with amazing pre-historic gems here and there, and our intention is to visit several of them this week. Cell phone coverage is unlikely in most of the area, but if I can find some wifi I’ll update the blog as often as possible.